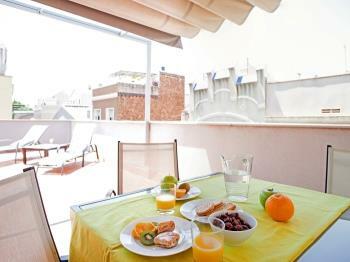 The Poblenou Beach 14 apartment (HUTB-003691) is located in the Barcelona district of Poblenou, only 5 minutes walking from Barcelona’s beaches. The master bedroom comes with a double bed and the second bedroom, with bunk beds. 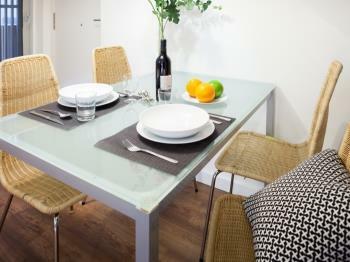 The living and dining area is a generous size and the fully equipped kitchen forms part of the same space. 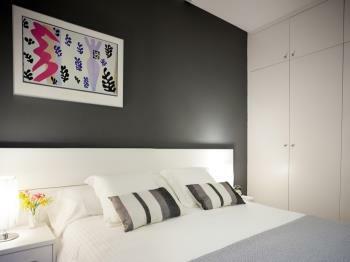 There is a double sofa bed in this same room, so the apartment offers accommodation for up to 6 people. 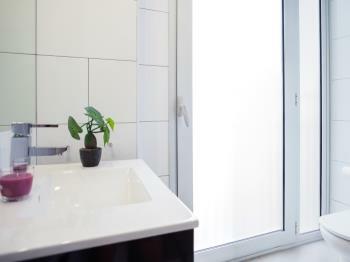 There is a modern and spacious bathroom with a walk in shower. 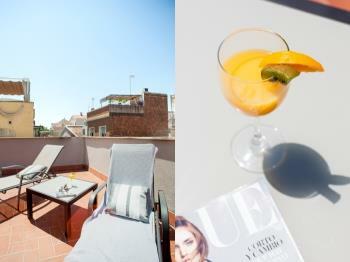 Finally, the true beauty of this apartment lies in its gorgeous private roof terrace, 40 square meter terrace, accessed from within the apartment, provided with sunbeds, table, chairs and a parasol. IMPORTANT: We have more apartments in the same building. These have either one or two bedrooms. 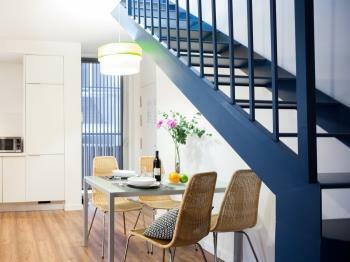 Apartment located in a new brand building with elevator. It has plenty of natural light and private terrace which is accessed by the stairs located inside the apartment. 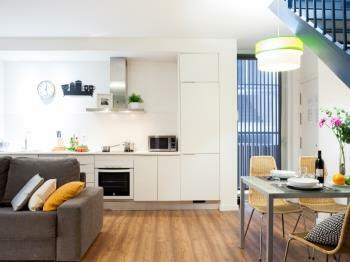 The large main room houses an open kitchen fully equipped with appliances and utensils. There is a dining table with chairs, a satellite TV, a DVD player and a sofa bed. 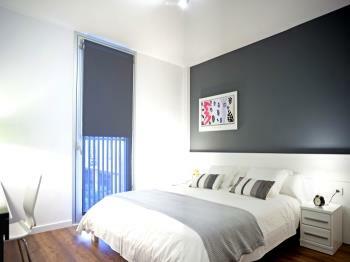 The master bedroom has a double bed, a wardrobe where you can keep your belongings during your stay and a dresser. The bathroom has a large shower and also has natural light. There is hair dryer. Contact us if you need to resolve any doubts before your arrival. During your stay, you can come to our office which is located 2 minutes from the apartment or call us to our 24h service phone. You will stay in a quiet family neighborhood 5 minutes from the beach. In the neighborhood you will find a large number of small shops and restaurants, so you can comfortably get what you will need during your stay. In the Rambla del Poblenou there are many terraces where you can sit outside. If you come for work, you will have the CCIB and the neighborhood of 22 @. 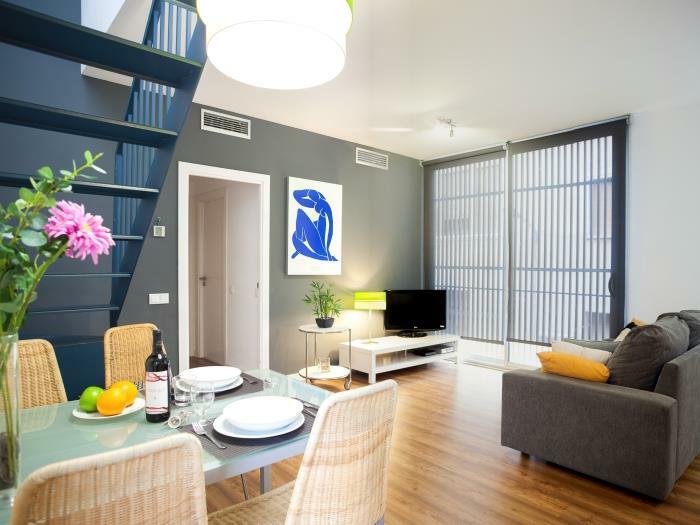 The closest metro stop to the apartment is Poblenou (L4 - yellow), which in 10 minutes will take you to the historic center of Barcelona. Another option to move very popular in the neighborhood is the bicycle. 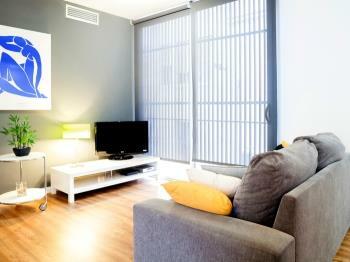 When you arrive in Barcelona you can rent them for hours or days. This two bedroom apartment (HUTB-003691) has plenty of natural light and a private terrace accessed by stairs located inside the apartment. 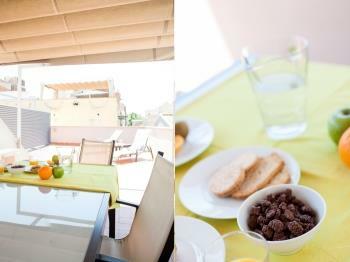 The terrace is a space where you can relax and is equipped with a table with chairs and sun loungers. 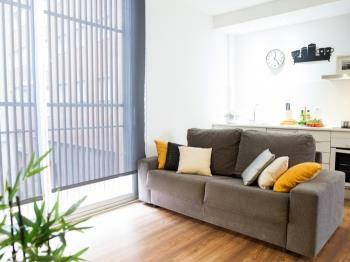 The main space inside the apartments gathers the living room, kitchen and dining room in a very spacious area. 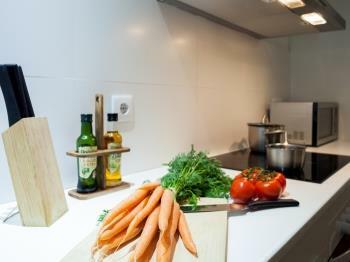 In the kitchen you will find modern appliances and utensils so you can prepare meals at home. There is a table with chairs. The large sofa becomes a bed. The TV has satellite channels and there is also a DVD player. 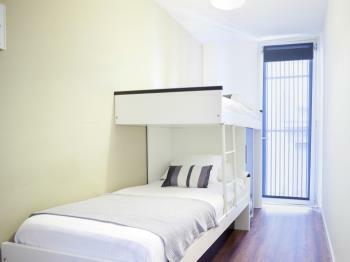 The main room has a double bed, a large wardrobe and an auxiliary table. The second bedroom has bunk beds and it is perfect for kids. 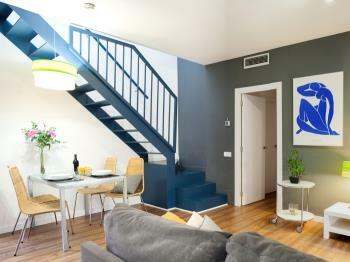 There is free WiFi throughout the apartment, heating and air conditioning.